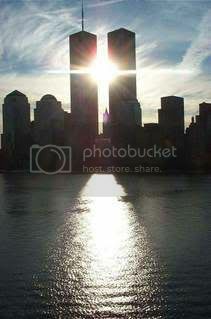 I don't want today to pass without making a post specifically in honor of 9-11. I really can't believe that six years have passed since this happened. What happened should never be forgotten and neither should all those who passed away and gave their life while trying to help. I pray that the families connected to all the victims have peace in their lives. I am proud to be living in the United States of America. With all the problems we face, I'm thankful to not be living under a regime that controls every facet of how I live to the point that I fear leaving my house.